My friend and a major contributor to the art of database architecture, Chuck McDevitt, died last week. Five years ago Chuck was diagnosed with an advanced cancer and given six months to live. He fought and endured and worked for most of those five years, teaching us all a little about how we might live our lives. Chuck’s contributions to database architecture are not so well known. He was employee number fourteen at Teradata and developed, with Dan Holle, the Teradata version of SQL. Chuck invented several foundational parts of any parallel database system. He left Teradata and went to Cogit, a start-up that developed a very early parallel data mining tool. From there Chuck went to Ab Inito as a senior architect, and from there he went to Greenplum where he was the Chief Architect. At Greenplum Chuck was the brains behind the development of their parallel version of Postgres. It is significant to note that Chuck’s architectural insights led to an extensible and powerful implementation that far exceeded the efforts of others trying to accomplish the same result from a Postgres starting point: Aster Data, Netezza, DataAllegro, and the Postgres community. To convey Chuck’s contribution to Teradata let me tell a story. After E.F. Codd published his ground-breaking papers on relational theory two research projects began to develop relational databases. The UC Berkeley project developed a query language that was called QUEL which was followed by an IBM Research project and a query language called Sequel. As Teradata entered the scene they developed a third query language that was called TEQUEL, selecting the best features of each. IBM then delivered DB2 and SQL/DS, and the Oracle Database appeared, all based on Sequel which was by then called SQL. QUEL was forgotten as SQL dominated the market leading to it becoming an ANSI standard in 1986. One Friday in 1985, the Teradata sales management convened a meeting to request that Teradata support SQL in order to effectively compete in the emerging RDBMS market. They were told by Product Management that it would take three years to develop SQL support… that it was out of the question. 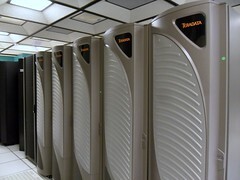 Further, the Teradata CTO argued that TEQUEL was superior to SQL and that this was an advantage in any case. Dan Holle heard about the meeting, called Chuck in and, convinced that the Teradata management team was headed in the wrong direction, started to work. What the technical Execs must have known, but clearly did not appreciate, was that Dan and Chuck had developed the Teradata database using what was at the time, a very advanced concept… compiling the TEQUEL query language into an intermediate language and then processing that. Working non-stop through the weekend Chuck developed an SQL parser that would generate the proper intermediate code for consumption by the optimizer and execution engine… and on Monday morning he demonstrated a functioning SQL version of Teradata. It is fair to say that, but for Chuck McDevitt, Teradata would not exist… and it is likely that Greenplum would not exist. As I repeatedly suggest in this blog… architecture counts… and you should all know that the database community lost a great architect last week. Chuck will be missed. I first encountered Chuck on the Teradata Masters mailing list about 10 years ago. Years later we swapped email discussing the pros and cons of him leaving Ab Initio for Greenplum – the CA weather was a key factor. Once he joined Greenplum I just knew they would make Postgres do what they needed it to do. As others will attest, it’s not a walk in the park by any means. I don’t think I’ve come across anyone so widely influential and admired in my 25 years in the MPP space. Great read, sorry for your loss and loss to the IT industry. Chuck’s fight should inspire us all. Really great obituary Rob. Having worked for Ted Codd and worked with Chuck I have to pinch myself for having been so fortunate to have learned so much from such great people. Chuck was a fantastic guy. A quiet and selfless genius who just got on with things. He was a true pioneer and I learned so much from him. Looking back, what a time that was. I don’t think any of us realised how far on we were in MPP development. I have such fond memories of our team at El Segundo. Thanks again for writing it. RIP Chuck. So sorry to hear this, although of course I had been dreading hearing the news for some time. I had the pleasure of working with Chuck at both Teradata & Greenplum (as well as a fair bit of socializing at Dave Shuttleworth’s place in East Molesey, & in San Mateo). At Teradata I recall he wrote the incredibly useful WinCLI (prior to ODBC) in his spare time, just for fun. At Greenplum it is no exaggeration to say that the work Chuck (& Kurt Harriman) did to get the PostgreSQL optimizer working in parallel were the main reasons they got a chunk of C round financing from Sang Ahn at Dawntreader Ventures (I know because it was me that made the recommendaton). He will be missed. P.S. was it Chuck or Dan that originally wanted to call TEQUEL TEQUELA, instead? Would’ve been a much better name if the Marketing guys had gone along with it…. In reply to Huw Ringer, TEQUEL was promoted by the one or two marketing people on the team. The marketing team pressed for a version unique from other vendors. This attitude (circa 1983) preceded the concept and benefits realized by open systems. Created in a very short period of time, Chuck also created a Windows version to Teradata to be used on personal notebooks. Rob I remember that meeting and that weekend like it was yesterday. It was Dave Clements, Walt Muir a myself on the sales side. We knew from the Partner meetings that Tequel would not sell. Both Chuck and Dan sided with us and did a “skunk works” project over the weekend which we had been told was impossible and would take, as you stated, a minimum of 3 years. Chuck and Dan made many magical things happen in support of the sales and SE’s in the field. Boy did they make TD a fun place!!! That is tragic. Chuck was a great soul in the database world. It was a privilege to know him and work with him. Rob, you certainly brought back some fond memories and captured the essence of Chuck’s brilliance. I was one of the field folks pushing for “SQL Compatibility” due to our prototype system at Shell Belaire Research Lab where they used SQL/DS. TD management just couldn’t grasp that to be competitive in the market we had to abandon the “far superior” TEQUEL and become SQL compliant. What wonderful, once in a lifetime, professional associations with the early Teradatans. We just got things done and Chuck, along with Dan, were true geniuses as well a great folks!! Good architecture lets you meet product requirements, and create a product that appeals to early adopters. Great architecture delivers more than that: it gives you the agility to rapidly meet the needs of the (much larger, mainstream) early majority… needs that are not yet known when creating the architecture. Chuck’s contribution was a textbook example of the latter. Chuck’s work was subtle enough that the company’s own management did not appreciate what it enabled. But its impact was far from subtle: speeding time to market by a couple orders of magnitude, Teradata was able to move beyond its beloved “lunatic fringe” and capitalize on a steady flow of failed SQL-based projects generated by non-scalable competitors… making a vital move into the mainstream. This helped Teradata go from being unprofitable to being profitable within a year… allowing them to not only survive (cross the chasm), but to generate 10s of billions in revenue over the years. In future blogs, Rob will document what Chuck did for the ensuing 1400+ weekends. “… convinced that the management team was headed in the wrong direction…”. Chuck was always in skunk-works mode because management, without his background, intelligence, and insight… often could not see it. That is the mark of a great architect. JLB: The Teradata Query Language was created about 6 years before the first SQL standard. So it wasn’t intended to be an SQL rival; it was created out of necessity to fill a void. It turned into an SQL rival when SQL emerged as a de-facto standard. Huw: The original spec referred to the language as TEQUELA. Sadly, Marketing changed the name to TEQUEL. This is the only known time in history in which a marketing guy actually turned down a TEQUELA. Rob, thank you for doing this, Chuck was an amazing person, and a great team player and its very good that you’ve given people the opportunity to remember him like this. I first met him when I was a fresh faced Teradata SE many years ago, and he was a great mentor and font of knowledge which he was happy to share, a great friend and great colleague. There are many, many instances of where he showed this – for example early on I needed to find out about the Teradata to DB2 (mainframe) interface, which he took me through, explaining how it worked and getting me up to speed so I could go back to the customer. Somebody told me afterwards that this had originally been raised as a need by another customer – and so Chuck had developed the mainframe interface to Teradata, translating the SQL and returned error codes in the process – in a weekend !! (the original version was against IBM SQL/DS if I recall). I remember thinking at the time he was explaining it how well thought through the approach was. To echo Dan’s point above, Chuck was able to do this not so much because he worked hard and put in the hours (which he did) but because he had an intuitive grasp of how to architect complex systems in a way that would make them flexible an easy to extend – the background mentioned above about compiling the SQL to an intermediate language – being another illustration of this. It was the quality of his thinking as much as the quantity of his work that made such a different and I learned a lot from him, he’ll be greatly missed. While I will remember the numerous discussions I’ve had with Chick over the years, my fondest memories were the Friday “SPFBB” gatherings. Teradata was a family as much as it was a company and I’ll always have good thoughts about that time in my life and in the industry. I really liked Chuck’s skunk ODBC driver, and its now we came to know each other. Miss him. Thanks for writing this Rob. I have had the privilege to meet Chuck just once and had the pleasure of working with Greenplum db for a few years. I read the original paragraph about Chuck’s departure and I cried. Because we lost contact in the last years, because I missed the last reunion, and because I cannot hope that he will somehow beat this cancer, I am sad. But then I smile. About the times I got to spend with Chuck and other Teradata greats, about reliving the many memoires in this blog and about the achievements Chuck left behind. I also attended that Monday morning, who could forget, where the them-and-us attitude about TeQuel was once again changed into one of those joint efforts that made Teradata great. And on the list of possible names for BTEQ was my favorite: McTEQ, which would have been the proper tribute to a man who didn’t need more accolades. Requiescat In Pace, Chuck! Chuck was an inventor. That is how I knew him. His inventions are a guide to my professional life. Just as Apple invented computing for creative arts, Teradata brought exploratory, experimental use of information into the corporate mainstream. Teradata was transformative. A Trojan Horse, in a positive way. Teradata looked and worked on the surface like an IBM product, but behind that surface was a pallet of capability that could reveal information and make process improvements that powerfully disrupted the way organisations made products and served their customers. It could put data in the hands and minds of everyone. It was exhilarating and expanding. Everyone that wanted to could explore, experiment and improve using data to empirically guide their thinking. Chuck and Dan were instrumental in creating this disruptive technology, because they were also in the field working passionately side by side with people to create capabilities for customers. I would not have survived long in the corporate world without it. Massively generous with their remarkable intelligence and creativity. Personally, the antithesis of the IBM blue suits, exploring the world and living their lives joyfully on their own terms. Over time we take great inventions for granted. They become the foundation for the next innovation. That is how it should be; but we should remember the risk takers and remarkable creative souls that set foundations and share their story as examples to learn from.